Being located in Prince Edward Island I have the good fortune of having access to freshly grown strawberries at the market starting in early June. If I want to make homemade strawberry jam or ice cream I will usually go and buy the fresh strawberries in bulk. 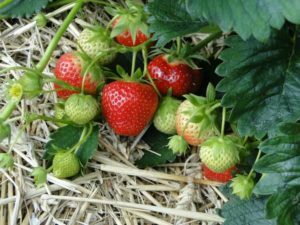 Learning how to grow strawberries yourself is simple enough though, and provides you with an easy to grow perennial perfect for beginner or advanced gardeners. A must in any homestead garden. If you have a large sunny yard you can easily grow strawberries in large quantities. Twenty-five to thirty plants is usually enough to feed a family of five with a good supply of homegrown strawberries, but that’s a lot of strawberry plants for a beginner! Planting six or seven plants, either in a raised garden bed or even in pots will produce a decent berry harvest for snacking while out in the yard or for smaller batch recipes and desserts such as this Strawberry Tiramisu. With a little bit of know how anyone can grow their own strawberries at home…even if you only have a balcony! There are generally three different kinds of strawberries. Ever bearing- These strawberries will provide a slightly smaller crop but will provide around three individual harvests starting in early summer and continuing to mid fall. Day neutral- Strawberries are similar to ever bearing varieties, in that they produce multiple harvests. The main difference between day neutral and ever bearing varieties is that day neutral strawberries just keep producing fruitas long as temperatures stay in a certain range. June bearing- The strawberries usually set buds in the Fall and then flower and set fruit the following Spring, (usually June). They have one large crop all at once before setting buds again in the Fall for the following year. 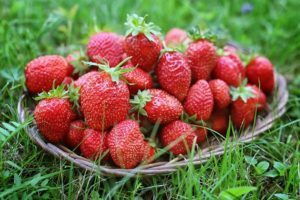 Each if these types of strawberries will behave slightly differently and selecting which variety to grow depends largely on your gardening zone, and what you plan on growing the strawberries for. 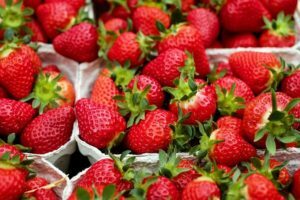 While growing strawberries from seed is possible it takes much longer, and it’s much easier to go to a reputable nursery and buy healthy, disease resistant, and pest free plants. Make sure you check which type of strawberry plant you are purchasing, and the variety. Different varieties will produce different sized fruit with varying firmness and sweetness. If you live in a northern climate ensure the strawberry plants are cold hardy! If buying from a local nursery this is usually not an issue but is something to consider when ordering online. If you do order plants online don;t be surprised if a dried out looking plant arrives. These are called bare-root stock and are essentially strawberry plants in a dormant state. This guide will show you step by step instructions how to plant bare root strawberries. Once you have purchased your new plants it’s time to get them in the ground. It’s best to plant them in your garden after all chance of frost has passed. Plant your strawberry plants on a cool, cloudy day to prevent transplant shock which can set back plant growth. You’ll need to select a site that has a minimum of 6 hours of consistent sunshine, but strawberries do best with 8 plus hours of direct sun. If your garden does not have such a location fear not, growing strawberries in pots and containers works very well which makes them ideal for moving around! Raised garden beds or vertical planters are all ideal for growing strawberries at home because they are quick draining and allow the fruit to dangle down making picking fruit easy. Vertical planters are great when short on space. Pick a spot that is well draining. If after a rain storm the area is flooded or very water logged it may not be the best location. While strawberries do require a good amount of water( amount 1 inch a week) to be productive, to much water isn’t good either. Prepare the ground and amend it with well aged compost and manure. Strawberries prefer a PH level of between 5.5 and 7, and soil which is not to dense or clay like. If planting multiple plants, dig a trench deep enough to accommodate the entire root ball without squishing it. Don’t go to deep, strawberries like to have the ‘crown’ of the root to be just at or above ground level. Keep the plants at least a foot apart and keep individual rows about feet apart to allow for the sprawling nature of strawberries. Fill in the trench with garden soil, again checking that the root crown is at or just above the soil level. Pat down the soil around the strawberry plants to ensure they are firmly planted. Water the plants by lifting the leaves and watering right at the roots. Splashing the leaves can encourage disease. Once planted mulch the strawberry plants with straw or newspaper. The mulch helps the soil retain moisture, especially on hot summer days and also prevents weeds from taking hold. You’ll also notice the ripe berries are much easier to pick and will be cleaner when laying on mulch then if nestled amoung weeds and grass. If you planted June bearing strawberries take note that they will not bear fruit the first year. Be patient and let them develop nice strong roots for next years harvest! Spring is the best time of year to plant your strawberries. If you already planted the strawberry plants last year and this is your second, or third year growing, remove the mulch or plant cover you used to protect the roots from snow and frost, once all danger of frost has passed. Once new leaves start to grow mulch around the strawberry plants with straw, newspaper, or grass clippings, 3 to 4 inches deep to discourage weeds. Depending on the type of berries planted, strawberries can start producing fruit as soon as june depending on the temperature. 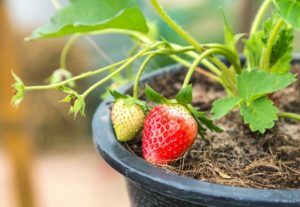 Strawberries have fairly shallow root systems so regular weeding and watering is important, watering especially so if growing strawberries in pots or hanging planters. Go out in the garden in the mornings before the sun has fully risen and remove any slugs you may find. I simply plop them in a glass of beer or water to drown. Learn more about keeping slugs out of your garden by natural means. In their first year flower buds and runners should be snipped off to encourage development of the root system. This will encourage a larger crop the next year. Pick fully ripened strawberries as soon as possible by sniping the stem. Pulling the berry from the plant may damage it, so resist the urge! If birds are stealing your ripe berries before you get to pick them, consider using bird netting as a row cover to protect the ripening fruit. Ripe berries will keep for 4 to 5 days in the fridge if they last that long. Whole strawberries also freeze very well and are great for making freezer jam, smoothies, or sauce. Some varieties will continue to produce fruit in the autumn. Keep picking ripe berries, and remove any fruit that is rotten or damaged to discourage disease. If you plan on growing new plants from runners, now is the time to let the runners take hold and root to create daughter plants. Find out how to grow new strawberry plants from runners in this video! In late fall once the strawberries stop producing fruit and the temperature starts to sink, you’ll notice the leave turn yellow and droop. Once all the leaves are yellow, mow or cut them off leaving an inch or two above the crown. Thickly cover the crowns with straw or leaves 6 to 8 inches deep to protect from the frost and snow. Once you’ve got a handle on how to grow strawberries at home, you’ll be rewarded with fresh fruit year after year! Comment below if you have or are thinking about growing strawberries in your garden! If you do, take a picture and tag me on Facebook & Instagram: @earthfoodandfire . Some of the links in this post lead to affiliate sites through which Earth, Food, and Fire may earn a small commission should you make a purchase. For more info check the Affiliate Disclaimer. All advice, and opinions are based on observations in my own garden.